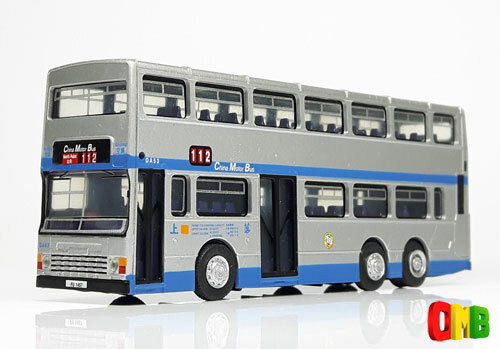 The model - the livery featured on this model was never applied to Dennis Condors. Only six of the final batch of Volvo Olympians, delivered in 1998, received this silver and blue livery. Further details of this model would be most welcome. The bus - the China Motor Bus 'DA' class entered service between 1990 and 1997. It consists of 92 vehicles, with DA1-DA56 featuring small top sliding windows, similar to UK vehicles, the windows being rubber mounted. DA57-82 have no opening windows, these still being rubber mounted, whilst the final batch, DA83-DA92, have bonded glazing. DA53 entered service in October 1993.